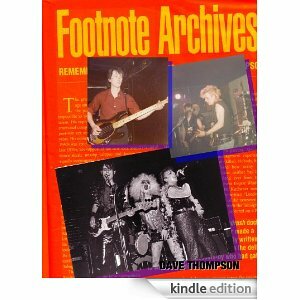 When the Footnote Archives column launched in Goldmine magazine back in 1995, the brief was simple. Once a month, America’s premier record collecting magazine would devote one full page to artists who, in some cases, might not ever have made a record… or, if they did, it wasn’t anything many of our readers would have heard of. 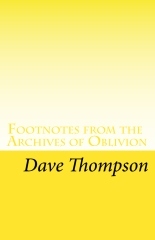 Eleven years later, FOOTNOTES FROM THE ARCHIVES OF GENIUS rounds up 39 of the 130+ different columns that have run over the past 11 years… a second volume, currently in preparation, will feature as many again. Many have been revised, not only to take into account subsequent reissues, but also to note sadder events as well – there have been as many deaths as there have been comebacks, after all, and I can’t help but feel a pang of regret at the thought that the last article these performers may have read about their “glory” days was published beneath the banner Footnote Archives. For their career might be a footnote to us, the outsiders, but for them… it was their life.